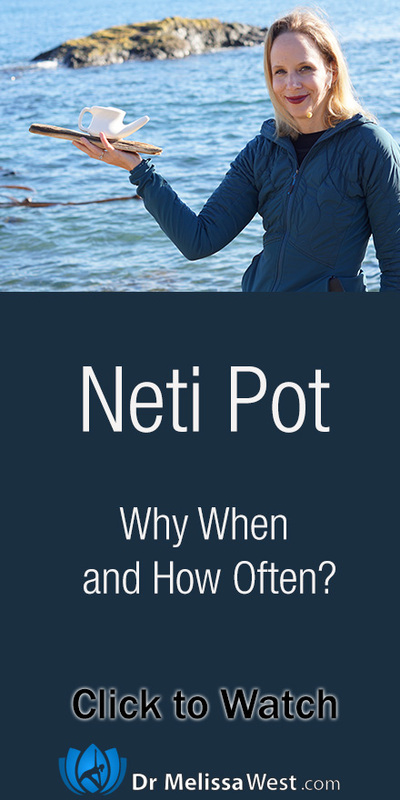 Neti Pot, Why When and How Often? You simply fill a neti pot with a saline solution (a combination of boiled water that has cooled and a teaspoon of salt). You lean over a sink and you pour the solution into one nostril, the saline solution travels around the septum, and out the other nostril. There is no force, it just goes in one nostril and out the other. There have even been studies that have shown people have contracted less colds when they have used a neti pot regularly. So the question is, how often should I use a neti pot? While it is important to clear your nasal passages of mucus or environmental toxins such as pollutants and infectious agents, it is also important to remember that our nasal passages contain important immune cells and probiotic colonies. Remember this class? Yoga with Melissa Episode 347 If you use the neti pot every single day, you could be stripping your nose of important probiotics and immune cells. 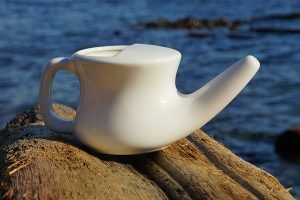 Dr. Nsouli recommends using a neti pot 3-4 times a week, in moderation, but avoiding daily nasal irrigation for long periods of time for healthy mucous membranes.